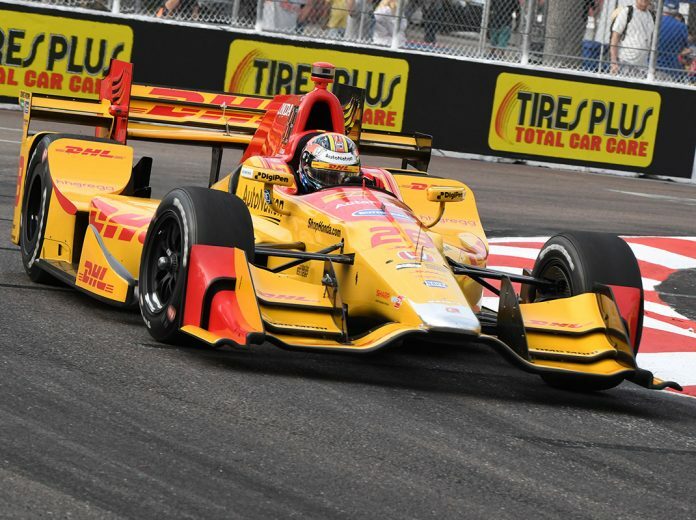 ST. PETERSBURG, Fla. – For Ryan Hunter-Reay, his fourth-place finish in the Grand Prix of St. Petersburg last Sunday was a dramatic improvement over the way his morning started. Hunter-Reay was involved in a hard crash into the turn 10 tire barrier in Sunday morning’s warm-up session. His Andretti Autosport team had to repair the car in time for Sunday’s 12:30 p.m. Eastern Time start. More problems hit the Fort Lauderdale, Fla. resident at the start of the race when his Honda engine suffered an electronic problem forcing him to the pits while the rest of the field took the green flag. The team had to quickly recycle the electronics to get the engine back to full power and he made it out of the pit by the slimmest of margins ahead of the pace car. That was an important move as Hunter-Reay’s Honda did not lose a lap and it allowed him to regain the battle throughout the race. When he passed new Andretti Autosport teammate Takuma Sato for fourth place at the checkered flag, it was the culmination of a long day that started off poorly and ended well. “It was a wild weekend,” Hunter-Reay said. “From the ups and downs of braking issues in second practice and then warm-up this morning, we definitely earned this one. We fixed engine calibration issues early on (in the race), got out in front of the pace car by about a second or two keeping us on the lead lap. “To finish today fourth was just awesome. This No. 28 DHL Honda team has done a great job all day. To fight back like that, I had to keep coming spot after spot really earning it, and then there at the end I got that spot back from my teammate Sato. We had a lot of fun out there driving every last drop out of the car, and it’s great to be back in the role and into the swing of things. Hunter-Reay, however, did have some criticism for Sato’s sometimes wild driving. Although he enjoys racing against the driver from Japan, he wasn’t happy with some of the moves and it will be interesting to see if these two drivers are able to find common ground now that they are teammates.